Finally someone has come out with an upgrade for the sustain block on newer Ibanez guitars. One of my main gripes with Ibanez guitars has always been the material used for the sustain blocks on their double locking bridges. Pot metal does not make for good tone. I’ve upgraded all of my Ibanez guitars with an assortment of brass and titanium blocks, and they make for much better tone and sustain. The problem for owners of newer Ibanez models with Edge Zero, Edge Zero II, ZR and ZR II bridges is that there has not been an option out there. The sustain blocks have also been smaller due to the complexities of the designs of the bridges. Whilst the modern designs may be great for tuning stability the tone has the potential to really suffer. Killer Guitar Components have come to the rescue with a new brass sustain block upgrade for guitars loaded with Edge Zero type and ZR type bridges. 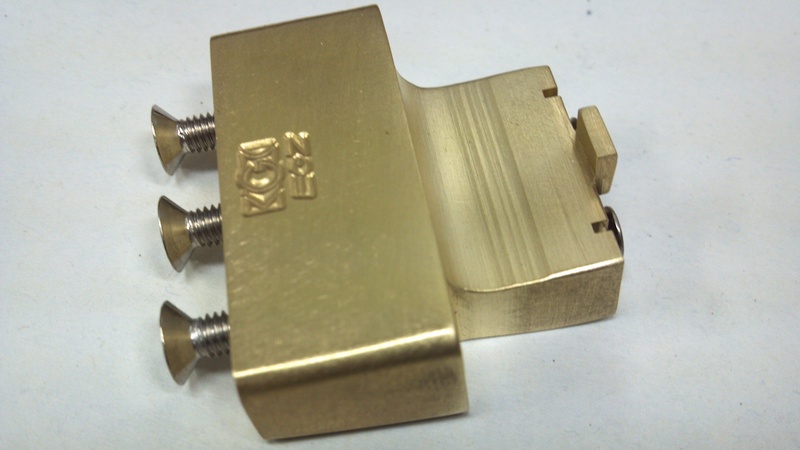 The Edge Z Brass Tremolo Block is designed to work with all of the aforementioned bridges, and it is very reasonably priced considering the work required to mill the block to work in these guitars. It’s great to finally see an upgrade for these bridges. They have some fantastic features not seen in many other bridges. Now you can have a great functioning bridge with great tone and sustain too. 8 Responses to "Cool new gear: KGC Brass Tremolo Block for Ibanez Edge Zero (II) and ZR (II)"
I am panixgr from the jemsite forums, I have the edge zero-ii 7-string non-ZPS version. It is on a UV70p guitar. Do you know if there is any block that would be used in place for the stock one? RGTFanatic says that an edge pro 7 might have the same spacing. Care to shed some light? (pls PM’me on the jemsite, or leave a message here), Thanx! Hi Panix, do you have a picture of the block? Killer Guitar Components may be able to help you with it. They may be able to make one for you if you can provide the block to them, or some accurate measurements. If RGTFantaic is right you may very well be able to go with an Edge Pro 7 block, but you would want to confirm measurements before purchasing. I will contact KGK as well. I think sustain on 20th or higher frets needs a little boosting. Sustain on lower than 20th frets is very good. Do you think a big brass/steel/titanium block will help in this regard? Brass would probably do the trick for you. It will warm up the tone and give you a thicker tone. Contact KGC and see if they can do anything for you. It seems KGC build a block for this trem! Great! KGC make excellent parts with a lot of thought put into their designs. They are definitely worth the price. Great quality and great results from the upgrades. Just a question, if you can answer this from your experience. My uv70p sustains very well. The only spots with problem is high-E 20th fret and higher. Would an upgrade KGC brass block help with this, or it wont have any difference? It’s hard to know and depends on the guitar and setup. At the 20th fret and higher you’re not going to find a lot of natural sustain anyway. The brass block will give you a bigger, fuller tone, so at any rate you will have a better sounding guitar, and you might find a little more sustain.